(Bloomberg Opinion) -- A big bet on low interest rates may not be the sure thing that many investors think it is. 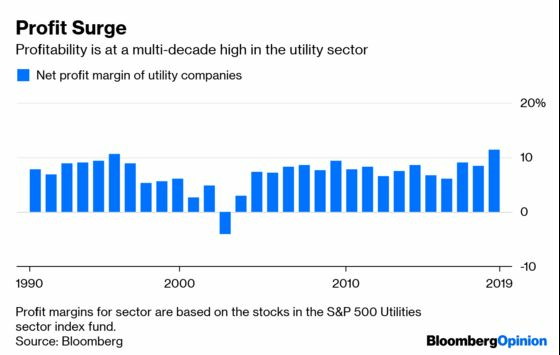 Stock investors have been piling into utility stocks, which are up 18.3 percent in the past year, including dividends. That’s far better than the broad market S&P 500 Index, which is up 10.5 percent in the same period. It’s even better than the 17 percent return of technology stocks. Among the S&P 500’s sectors, only real estate investment trusts, which have been boosted by high dividend yields, have performed better. It’s not unusual for utility stocks to outperform the market in times of market trouble. But the fact that the sector has continued to be one of the best performers this year, as the market has roared back, is notable, particularly recently. Shares of utilities shot up in mid-March after the Federal Reserve signaled that it might refrain from further rate hikes for the rest of the year. Low interest rates are typically good for utilities, and for REITs, both of which become attractive to investors looking for yield. Low interest rates also tend to signal low economic growth. Utilities, because they are in the business of delivering power, tend to have slow but uniform growth, though they do experience drop-offs in use during recessions, like any other sector. Still, there tends to be less of a growth trade-off with utilities when the economy itself is slow, as it may be now, with some economists predicting that first-quarter economic growth could come in at just 1 percent or less. The problem is many investors have the same idea. 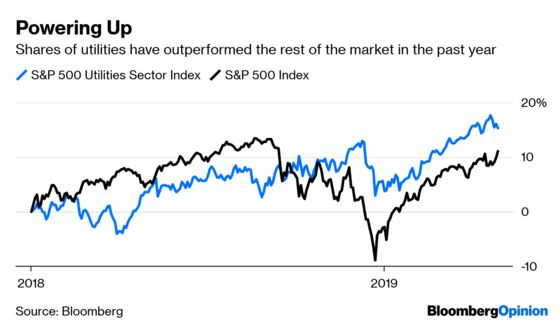 According to strategists at Bank of America Merrill Lynch, the utility sector, at a recent price-to-earnings ratio of 19.5, based on trailing income, is the most expensive in the market compared with where those stocks typically trade. The high valuations may mean stock buyers are not receiving the protection they think they are. Dividend payout ratios, which are the percent of income that utilities pay out as dividends, have slumped to a recent 69 percent from as high as 115 percent in late 2016. That is lower than the sector’s 10-year average of 77 percent, but that may not be low enough to justify investors’ exuberance. That’s because profit margins are now at 11.4 percent, for the trailing 12 months, which is the highest they have been since the mid-1990s. Bank of America Merrill Lynch strategists, who recently lowered their rating on the sector to “underperform,” believe those profit margins could fall soon. But the biggest problem may be that the Fed’s pause on increasing interest rates may not be a mortal lock. The yield on the 10-year Treasury bond did drop after the Fed’s announcement, to less than 2.4 percent, but it has rebounded recently to 2.5 percent. Many think that first-quarter gross domestic product was dragged down by the government shutdown and will recover later in the year. Profits of the companies in the S&P 500 are expected to shrink in the first quarter. But analysts envision bottom-line growth returning to 9 percent by the fourth quarter, and double digits after that. If the economy is still expanding by 2020, the Fed will most certainly have to be wary of some inflation. Unemployment, too, is still historically low. The utility sector has traditionally been the worst-performing one when interest rates are rising. Many investors are betting against that. But interest rates, as an economic professor once put it, are an enigma. If the rate outlook shifts again, utility stocks could shock investors.